Coca-Cola Amazon Offer-hello Guys, We are here with A New Amazon ash offer.Coca-cola Is offering Free Amazon cash With Every Coca-cola Pack.Remember that Pepsi paytm offers: Pepsi was offerings Rs.15 paytm cash With Every two-liter pack but Coca-cola is a bit better in cash back , coca cola offering from rs.35 to Rs.92 Amazon Cash.The offer is Valid on purchase of Fanta, Limca, Sprite. So Guys Read This Post along with Terms And Conditions For Full Offer. 1.) Visit Your Nearest Cold Drink Store or Any Coca-Cola Parlor. 2. Now Purchase New Pack Of Fanta,Limca or Sprite. The Offer is open to Indian citizens residing in India only. 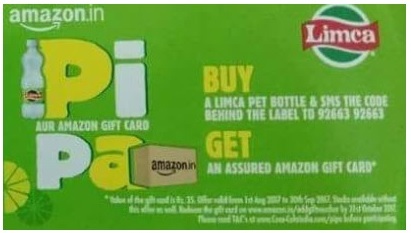 This Offer is available on the purchase of the Coca-Cola products, Limca, Fanta or Sprite that are sold in PET packaging / bottles (“Products“). 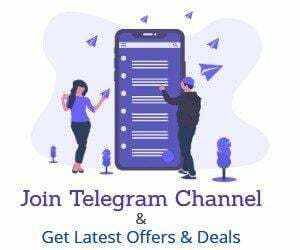 The Products eligible for the Offer with the corresponding benefits, are listed in the Schedule to these terms and conditions. Through the Offer Period, customers who purchase the Products shall be eligible to receive an alphanumeric Amazon.in gift card code (“GC Code“) of a pre-determined amount (set-out in the Schedule), which shall redeemable on the website www.amazon.in (“Amazon.in“). The GC Code can be redeemed (in the manner specified below) to get ‘Amazon Pay Balance’ equivalent to the pre-determined value of the GC Code. For the avoidance of doubt, it is clarified that ‘Amazon Pay Balance’ is the sum of all balances associated with Gift Cards in your Amazon.in account. (a) To receive the GC Code, the customers will be required to purchase a Product and SMS the unique code (not the GC Code) that has been printed behind the label of the Product (“Unique Code“) to 9266392663. The customers need to send the SMS with the Unique Code before September 30, 2017. The “Steps to participate in the Offer” instructions form a part of these terms and conditions. The terms and conditions for redemption of the Code are available at: www.amazon.in/giftvouchertnc. The GC Code can be redeemed only on Amazon.in and can be used to make purchases on Amazon.in, subject to the Gift Card terms and conditions available on Amazon.in. The customer’s use of Amazon.in is governed by Conditions of Use and the Privacy Notice published on Amazon.in. CCIPL and/or Amazon do not endorse any of the products or brands being offered on Amazon.in and will not accept any liability pertaining to the quality, merchantability, fitness, delivery, warranties or after sales service of such products. Sir will you please help me to find the code. There are two code behind the lebel. One is of 5 digit (upper part) and the other is of 3 digit (lower part) on the cap. Which one is the correct code upper or lower or both. I tried but every time it replied as please invalid code. Sir please guide. Sir will you please help me to find the code. There are two code behind the lebel. One is of 5 digit (upper part) and the other is of 3 digit (lower part) on the cap. Which one is the correct code upper or lower or both. I tried but every time it replied as please invalid code. Sir please guide…..
Join Both of them and then Send it.